The book world is incredibly lucky to have G. Thomas Tanselle beating the drum, as it were, for book jackets. Since 1971, when “Book-Jackets, Blurbs, and Bibliographers,” the first of his major essays on dust jackets, appeared, Tanselle has been writing about the failure to preserve book jackets--by collectors, by dealers, and by institutions--and how that failure has affected the study of books and book history. The Bibliographical Society of the University of Virginia (in association with Oak Knoll Press) recently re-published Tanselle’s essay in Book-Jackets: Their History, Form, and Use, an outstanding resource for the book world. His later essays, “Dust-Jackets, Dealers, and Documentation” (2006) and “Coda: News and the Nineties” (2010) are also included. Most people believe the book jacket to be a modern creation. Even the great Matthew Bruccoli got it wrong when he declared Stephen Crane’s The Red Badge of Courage (1895), to be the first American novel in a jacket. Tanselle believes that printed jackets were common as far back as the 1870s, but they were routinely discarded. Over the past forty years, he has located 1,888 examples of book jackets, stretching as far back as the proto-jackets/coverings of the 1820s. A color insert shows off a few of them, and a list of pre-1901 printed book jackets is printed in the second half of the book. Tanselle’s collection of nineteenth-century book jackets--the basis for much of the research presented in this book--will soon be placed at Yale’s Beinecke Library, where Tanselle’s collection of American imprints also resides. To view the table of contents, an excerpt, or a slideshow, or to order the book, click here. The book world is incredibly lucky to have G. Thomas Tanselle beating the drum, as it were, for book jackets. Since 1971, when "Book-Jackets, Blurbs, and Bibliographers," the first of his major essays on dust jackets, appeared, Tanselle has been writing about the failure to preserve book jackets--by collectors, by dealers, and by institutions--and how that failure has affected the study of books and book history. 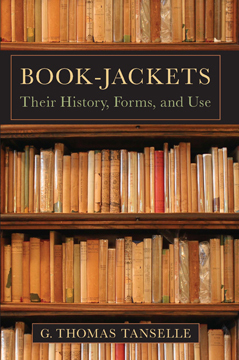 The Bibliographical Society of the University of Virginia (in association with Oak Knoll Press) recently re-published Tanselle's essay in Book-Jackets: Their History, Form, and Use, an outstanding resource for the book world. His later essays, "Dust-Jackets, Dealers, and Documentation" (2006) and "Coda: News and the Nineties" (2010) are also included. Most people believe the book jacket to be a modern creation. Even the great Matthew Bruccoli got it wrong when he declared Stephen Crane's The Red Badge of Courage (1895), to be the first American novel in a jacket. Tanselle believes that printed jackets were common as far back as the 1870s, but they were routinely discarded. Over the past forty years, he has located 1,888 examples of book jackets, stretching as far back as the proto-jackets/coverings of the 1820s. A color insert shows off a few of them, and a list of pre-1901 printed book jackets is printed in the second half of the book. Jacket restoration? Nay! Tanselle writes, "A few prominent dealers have forgotten that the product they are selling is historical evidence, and they have violated collectors' trust by supporting the alteration of that evidence (even when they have disclosed it)." And, "To condone the alteration of artifacts for cosmetic reasons is to rob collecting of meaning as a serious intellectual pursuit." Tanselle's collection of nineteenth-century book jackets--the basis for much of the research presented in this book--will soon be placed at Yale's Beinecke Library, where Tanselle's collection of American imprints also resides.